I'm stuck in lvl 6, can't find hint for the buttons but gotta run now. just to give a bint, in lvl 2 there are clickable walls, start from the spot under the japanese letters. In room 6 you need to do the buttons in front of the guys. The hint is the numbers on the wall and the clock in room 3. In room 7 is the hint for the other buttons. I dont understand level 3... anyone still there? 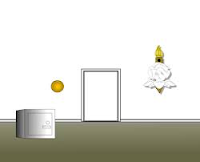 On the sign you see, as faint background, a checker pattern, that's the hint for the right room and a kind of diamond pattern, that's the hint for the left room. haha! I knew it! I love Gene, he's the funniest one on the show! :) Still dont understand the POBODD though! lol! on level six, I can only press the large/small buttons on the wall. the buttons in front of the boy & girl are unpressable, as is the grey button on the wall between them. What's the trick? You need the arm you broke off from the statue too press those buttons. I finally got it! I could not see the pattern, so I had to bring it into photoshop to increase the contrast! I see it now... on the level 5. I have an arm and a weight. not sure what to do! Thx for AO for posting and Dazz for submitting it. Same here, AO. Nothing happens, hmmm. Thanks for posting this, Dazz!! It requires a good bit of puzzling out - but, as usual, has such a very satisfying ending. I so enjoy the humor also! If spanking code isn't working, re-enter the scene and try again. Maybe the red bellow must be pressed first idk.. The balloon keeps deflating, I have to see the hint quickly, but even so, nothing happens. when getting dials hint: there is a GoGo arrow. Finally, I had to restart the game for the clock/spanking game to work. Thanks all. Excellent fun, thanks! And thanks for the level 6 hint, I saw 8 and 4 on the wall, but since I don't know Japanese I automatically didn't know the Arabic numerals either. Or something like that.